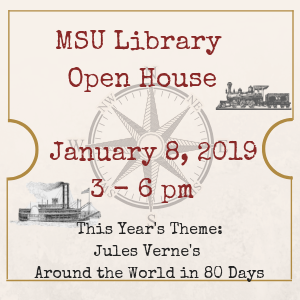 MSU Library will host its annual Open House from 3-6 pm on Tuesday, January 8, 2019. The event takes place in conjunction with the Provost’s Spring Convocation activities. MSU faculty, staff, graduate students, and Bozeman community members are invited to enjoy finger food, listen to a KGLT DJ spin tunes, and learn about services and resources offered by the Library and its partners. This year’s theme, Jules Verne’s Around the World in 80 Days, offers the chance to celebrate other cultures and contemplate one’s place in an ever diversifying world. Food will be served and there will be door prizes.